HOW LONG DOES IT TAKES TO SPROUT? No doubt, sprouting takes time and it seems like a long process but it requires minimal work and rest all is done by mother nature. Climatic conditions play a vital role in the whole sprouting process. In warm and humid months beans and grains may take just 2-3 days to sprout whereas in winter months this process is extended to 5 -6 days. On an average, the whole process take 4- 5 days to reach the desired 1/4 inch of sprouted beans. Sprouting turns even the hardest bean into soft and tender sprouts. In fact, fully sprouted beans are so soft that they can be eaten raw. With this method you can sprout any beans, grains or seeds. Sprouting time will vary. 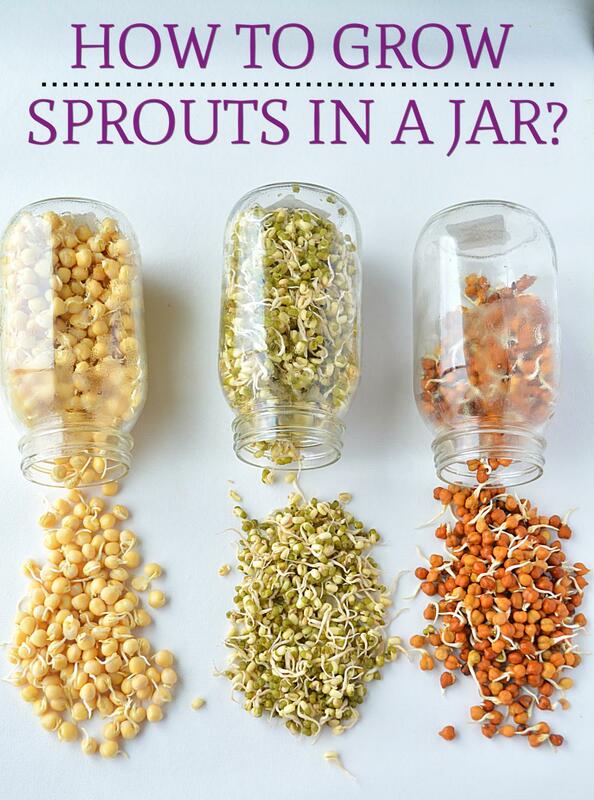 In this post learn how to make sprouts – the traditional way and how to grow sprouts in a jar. Sprouting aids digestion. For some people it is really difficult to digest grains, legumes and seeds because they are hard on their stomach. The simple process of sprouting unlocks the important enzymes in germinated seeds, beans, and grains, making them easier to digest. Sprouted seeds are a great source of fiber and are loaded with antioxidants. In reality, Sprouted seed has far more vitamins and nutrients than the dry seed. Sprouting is a great way to release all the vital nutrients stored in the dry grains/beans. After soaking the sprouted beans, seeds and grains become low in calories, high in fiber and vitamins. They are also a great source of magnesium, riboflavin, vitamins C and K.
Sprouted seeds is a great way of incorporating proteins and other healthy nutrients in your diet. HOW TO MAKE SPROUTS – THE TRADITIONAL WAY? Follow the step by step process below and grow delicious, fresh and healthy sprouts at home. Recipe for Black chickpeas (kala chana) sprout – Lotus stem or kamal kakdi cutlets. 1. Wash and clean 1/2 cup of moong beans (or your favorite beans/seeds) under tap water 2-3 times until the water runs clear. Transfer it to a clean sterilized bowl and add enough water to soak the beans. Cover the bowl with the lid and let it soak overnight. 2. This is how the beans will look like after soaking – swelled and doubled in size. 3. Drain the water and rinse the beans couple of times. 4. Transfer it to the same bowl. Add fresh water and completely discard the water you had used to soak the beans earlier. Let it soak for another 6-8 hours. 5. Beans have expanded as they have soaked up a lot of water. If any “white floaters” float to the top during the day. Remove it with a spoon and continue sprouting. This will reduce the chances of harmful bacteria to breed. 6. Drain and rinse the beans with tap water couple of times by running your fingers in between the grains. Rinse frequently (every 12 hours in winters and every 6 hours in summers) by running your fingers in between the grains. 7. This is how the beans will look like after 24 hours. With the first sign of sprouts remove sprouts from water. 8. Transfer sprouts to a wet cheesecloth and place it over the strainer. 9. Wrap the wet cheesecloth around the beans. Make sure the cloth is damp. 10. Rest the strainer (containing beans) over a bowl. This bowl will collect all the extra dripping of water. Let is rest for another 6-8 hours. Sprinkle even water and make sure that the cheesecloth remains damp during the entire sprouting process. Beans need to remain moist throughout the sprouting process. If they are dry, it will kill the sprouting process. 11. Moong bean sprouts are ready. 12. If you want your sprouts to grow longer than let it rest for 1 more day and you can have sprouts like the ones pictured below. Once the seeds have fully sprouted. Time to store them. Drain any excess water and dry sprouts in between a clean paper towel until they feel dry. Store in a airtight container in the refrigerator. 13. These fully sprouted beans are so soft that they can be eaten raw. Or you can store it in airtight container and use as directed. Good for 4-5 days. Store in the refrigerator. Though I prefer to use them in a day or two. HOW TO MAKE SPROUTS IN A JAR? 1. Wash and clean 1/4 cup of moong beans under tap water 2-3 times until the water runs clear. Transfer it to a clean jar and add enough water to soak the beans and close the jar with the lid. Let it soak overnight. 2. Next morning – drain the water and rinse the beans. Add fresh water and completely discard the water you had used to soak the beans earlier. 3. Cover the mouth of the jar with a cheesecloth and tie a rubber band around it to secure the cloth. I have secured the jar with their lid rings (top removed). 4. Place the jar in a warm place and let it soak for another 6-8 hours. Beans have expanded as they have soaked up a lot of water. Drain and rinse the beans with tap water. Sprouts after 24 hours. 5. Remove the cloth and wash the beans under cold water. With the first sign of sprouts remove sprouts from water. Drain all the water, and transfer it back to the jar and let it rest in a warm place for another 6-8 hours. Beans after 30 hours. 7. Beans need to remain moist throughout the sprouting process. If they are dry, it will kill the sprouting process. Some basic precautions should be taken during the entire sprouting process to reduce the risk of exposure to harmful bacteria and avoid getting sick. No doubt that sprouts are super healthy foods but if not taken care, it could become a breeding ground for harmful bacteria and other microorganisms. Sprouting bowl or Jar – always use a sterilized vessel for sprouting. Seeds – Always use fresh seeds for sprouting. If the seeds or beans are very old, it may not germinate properly. The same method works for seeds, other grains and pulses as well. Water – use fresh water for spouts. Sprouted seeds needs only ingredient to sprout and that is water. So make sure you completely drain your sprouts daily and add fresh water to the bowl. Rinse – Rinse frequently (every 12 hours in winters and every 6 hours in summers) by running your fingers in between the grains. If any “white floaters” float to the top during the day. Remove it with a spoon and continue sprouting. This will reduce the chances of harmful bacteria to breed. Once the seeds have fully sprouted. Time to store them. Drain any excess water and dry sprouts in between a clean paper towel until they feel dry. Store in a airtight container in the refrigerator. With right practices, you can enjoy homemade wholesome sprouts all year long!! Sprouts need a warm and damp environment to grow. Germinating seeds do not prefer light. All they need is an ideal temperature of 75-80 degrees F (22 degrees C) for proper germination. So in winters, maintain a constant warm temperature and see your seeds germinate in desired time. Don’t forget to take the precautionary measures (wash and change water frequently). To germinate the beans faster( especially in Canada where outside temperatures now are subzero) I soak them and on the 2nd day put them in my oven with only the oven light on. That too provides too much heat and so I take them out every 6 hours and change the water and keep them on the counter for 6 hours before returning them to the oven. Thanks for your sharing, Cyril! the sprouting beans in a jar method is awesome, because it takes little space and is convenient. I always avoided sprouting because it involved tying beans in cheesecloth and finding a place to hang it for a long time. I have a question though, can we store the sprouted beans in the same jar in the refrigerator after rinsing them ? This is one of the best posts on sprouting that I have come across. Superb job in detailing the process. Now I know how to make sprouts- how cool! Thanks for sharing this at Fiesta Friday #117! My pleasure. 🙂 Glad you liked!! 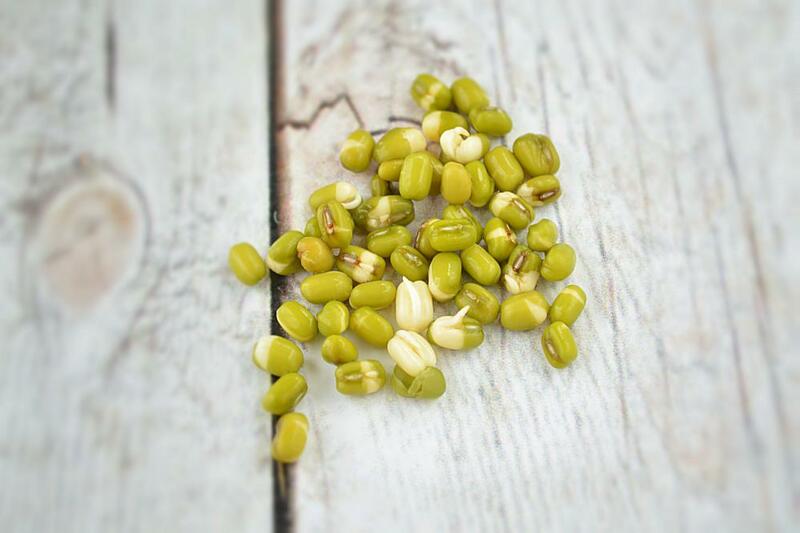 I have always meant to do more with sprouted beans so this explanation is very helpful to me! Thanks for bringing this by Fiesta Friday! hi ruchi you did a very good job explaining the step by step process. I loved it a lot. I have a small doubt washing the beans avoid foul smell but removes the nutrients right? Plz teach me if i m wrong. Thanks for stopping by Sathya! Glad you liked the post. From what I know, washing doesn’t affect the nutrient content of the sprouts. In fact repeatedly washing of sprouts is recommended to prevent bacteria growth and avoid that murky smell. Instead, cooking of sprouts is discouraged as during cooking, sprouts lose their nutritional value. Hope that answers your query! This is an awesome post Ruchi! Sharing further.